Kathleen Paddoon Napanangka, Nakarra Nakarra, 2018. Synthetic polymer paint on linen, 80 x 120cm. 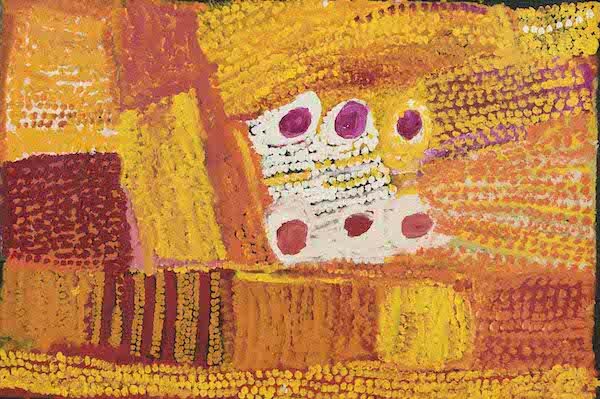 Courtesy: the artist, Warlayirti Artists and Alcaston Gallery, Melbourne. Alcaston Gallery presents new paintings by senior artist Kathleen Paddoon in her first solo exhibition at Alcaston Gallery. Kathleen Paddoon paints her mother’s country, Nakarra Nakarra using a vibrant colour palette and expressive brushstrokes to depict this significant country and Tjukurrpa (dreaming). Kathleen is a senior custodian of the Nakarra Nakarra Tjukurrpa (Seven Sisters’ Dreaming), including all of the associated ceremonies and songs from the country south of Yakka Yakka. Irene Paddoon, Kathleen Paddoon’s daughter, will be present at the opening event to officially launch her mother’s exhibition, accompanied by Poppy Lever, Studio Coordinator, Warlayirti Artists.